We are doing our part to help speed the return of VICTORY. Men and women in the various branches of the armed forces are being encouraged, inspired and stimulated by the teachings in YOUR PHYSIQUE. Defense and civilian workers are gaining the knowledge — through these pages — to help them KEEP or GET well and strong and become more efficient. We are doing our part to help build the finest type of young manhood, who possess the rugged stamina, the physical prowess and the “will to do” to bring us VICTORY. These young men can “take it” and “dish it out” bringing woe to the foe. The war can’t be won by weakling or pampered pets. 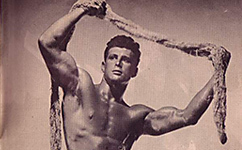 “YOUR PHYSIQUE” presents in each exciting issue successful formulas vital to Victory. After all is said and done, while the present war is highly mechanized it still depends upon a SUPERIOR MANPOWER. To ensure this SUPERIORITY is our job. We’re building two-fisted, red-blooded MANHOOD that the Allied Nations are clamoring for. 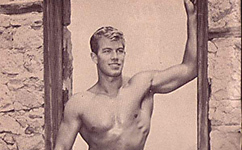 We’ve been proud and astonished to note how many “YOUR PHYSIQUE” readers have so quickly risen in the ranks. There’s no need to waste time effort or money on antiquated, outdated training. In this great National Emergency our Teachings have a NEW and GREATER significance… building a more rugged, huskier, more powerful and courageous type of MANHOOD. We’re showing men and women everywhere how to put the “Blitz” on weakness and costly diseases. FOR THIS IS NO TIME TO BE FRAIL! Giving motivation to do bodybuilding exercises, giving 15 arguments that body training will greatly affect your health! A very detailed and vast explanation of triceps muscles development with a number of simple bodybuilding exercises! Learn how to avoid “colds”: coughs catarrh, bronchitis and other winter illnesses by properly choosing your diet. Category: Physique magazines || tag(s): Your Physique Publishing Company by skdyancerpc.